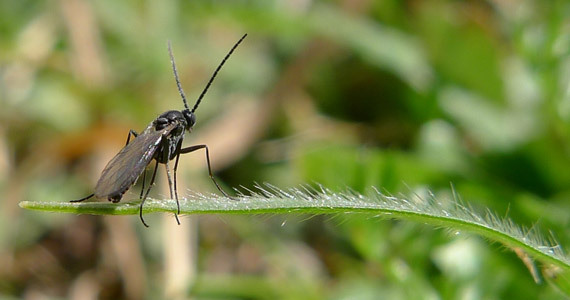 The adult fungus gnat is a small black fly, about 3-4 mm in length. They are commonly seen swarming in greenhouses because they are attracted by the humidity, high temperatures and decomposing organic matter. 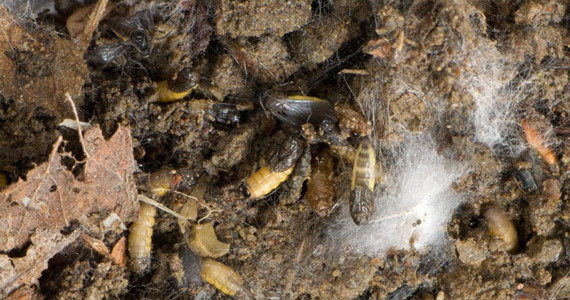 Crop substrates offer ideal conditions for their larvae, which are white and legless, resembling small worms. They feed on organic matter and the tender parts of plants below the ground, such as roots, as well as the stems. Fungus gnats (families Mycetophilidae and Sciaridae) are a common pest of plants grown indoors, especially where humidity and moisture are high. They’re usually first noticed when the harmless adults are seen flying around house plants or gathered at a nearby window. Make sure air is blowing over the top of your soil and water your plant properly. Adults live about one week and lay up to 300 eggs in rich, moist soils. Within 4-6 days tiny larvae emerge and begin feeding on plant roots during their two week period. The pupal stage lasts 3-4 days before young adults leave the soil and begin the next generation. The entire life cycle from egg to adult may be completed in as little as 3-4 weeks depending on temperature. Because of their proclivity and relative short gestation, potted plants can host each stage — egg, larvae, pupae, adult — in multiple generations at once. Because of this remedies usually require repeated applications until there are no surviving eggs. Plant symptoms that indicate fungal gnats are seen as sudden wilting, loss of vigor, poor growth, and yellowing. With severe infestations, a considerable portion of the plants may be lost. Inspect plants thoroughly prior to purchase for signs of insect pests. Turn up soil carefully near the base of the plant and look for the glossy, clear larvae. Reject any plant sending up flying gnats. Fungus gnats do best in damp soils; be careful not to over water, especially during winter months when plants require less water. When potting, avoid organic material that holds water, such as algae, which may encourage egg laying. If pests are present, allow the soil to dry to a depth of one to two inches between waterings. This not only kills larvae and inhibits the development of eggs, it also makes the soil less attractive to egg-laying females. Use Yellow Sticky Traps placed horizontally at the soil surface to capture large numbers of egg laying adults. The gnats are attracted to yellow and are easily removed on the trap before they can lay more eggs. Top dress houseplants with Beneficial Nematodes to destroy the larvae stage. Nematodes are microscopic round worms that penetrate fungus gnat larvae, as well as harmful lawn and garden grubs , fleas, and other soil-borne pests (they do not harm earthworms), then release a bacterium that consumes the pest from the inside out. The long-lasting nematodes are safe for use around pets, plants, and your family.